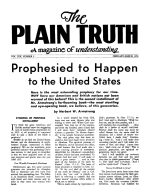 In this Atomic Age... is the BIBLE out-of-date? This world is sick! People are fearful of the future! Do we need a NEW approach to spiritual problems? Nearly everywhere we hear men declare that a "new concept of God and morality" is necessary. The Bible, they say, is impractical. It is filled with superstition and errors. Indeed, something IS necessary to change this world's plunge to doom. But can the world be changed by throwing away the Holy Scripture? What would take its place? The World in CONFUSION! We live in an educated age, an age of tremendous technological advancement. But instead of peace and security, we are reaping the fruits of fear and of war!